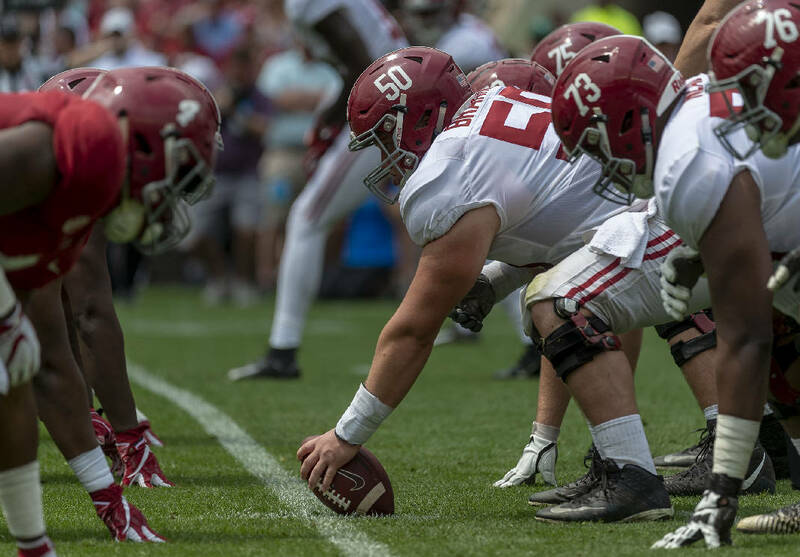 Alabama center Hunter Brannon (50) prepares to snap the ball during the first half of Alabama's A-Day spring football game Saturday in Tuscaloosa. Such challenges exist, though, even for the Tide — and especially for a defense that was uncharacteristically vulnerable late last season — which had seven underclassmen declare for the NFL draft after the season, a larger-than-usual exodus. "We have a very young team," Saban said this past week. "We don't have a lot of depth. We'll welcome the new players that we have coming in the fall. I think there's a dozen more, and maybe some of those guys can contribute to some of the issues that we have from a depth standpoint." With 15 members of the nation's No. 1 recruiting class already on campus, it's hardly a sob story for Alabama, which held its annual A-Day spring game on Saturday, pitting the first-team offense versus the first-team defense. As usual, there are opportunities in some spots for newcomers to play early roles. The candidates include a pair of top-10 prospects — defensive end Antonio Alfano and offensive tackle Evan Neal — along with two four-star quarterbacks with crimson bloodlines. Saban is looking for a starting tackle with the early departure of projected first-round draft pick Jonah Williams, and Raekwon Davis is the only returning starter along the defensive front. It wasn't the typical Alabama defense even before four of that unit's members left early, a fact painfully reinforced in a 44-16 loss to Clemson in the national championship game in January. Alabama allowed an average of 345 passing yards to a trio of star quarterbacks — Georgia's Jake Fromm, Heisman Trophy winner Kyler Murray of Oklahoma and Clemson's Trevor Lawrence — in the final three games. The Tide gave up eight touchdown passes without an interception during that stretch. On the other side of the ball last season, Jalen Hurts gave Alabama the luxury of a backup quarterback who had started his first two college seasons, but now he is at Oklahoma as a graduate transfer. Mac Jones was the Tide's third-string quarterback last season but completed only five passes in mop-up duty. He put up the biggest numbers in the spring game among the backups, finishing 19-of-23 for 271 yards with two touchdowns and an interception after playing mostly in the first half. Freshmen Taulia Tagovailoa, Tua's younger brother, and Paul Tyson, the great grandson of iconic former Alabama coach Paul "Bear" Bryant tried to take advantage of a chance to perform in front of Tide fans at the spring game. Taulia Tagovailoa was 6-of-9 passing for 93 yards with a touchdown and an interception. Tyson attempted five passes, completing one for 8 yards and getting picked off once. Tua Tagovailoa finished 19-of-37 for 265 yards with one touchdown and one interception. The defense was credited with four sacks each of him and Jones, three sacks of Taulia Tagovailoa and one of Tyson. Jerry Jeudy was the leading receiver for the Crimson team, which had the first-team offense and the second-team defense, with five catches for 104 yards. For the White team, Brian Robinson Jr. led with six catches and John Metchie led with 133 receiving yards. Both offenses combined for just 63 yards on 47 rushes, an average of 1.3 per carry.